Before I begin, I'd like to give a big thank you to Kiyo, for helping me with the blog designs. Being such a geek, he knows *really* a lot about web designs, photography, editing and such. Great to have someone to learn from and to get advice from. He's been of great help to my blog, with such an eye for good designs and things to add to the blog. Anyway, over the weekend (Saturday) took the time to go to Caribbean Bay, because of the discount that they were offering for 2 weeks due to Korean Thanksgiving Day. From the original price of 50,000W they lowered it to 18,000W per person, for 2 whole weeks, incorporating the Thanksgiving Day in the middle of it all. Well, because we only found out about it like 5 days before it ended and we had class, it was a really last minute and impromptu decision to just go with it and try it out. 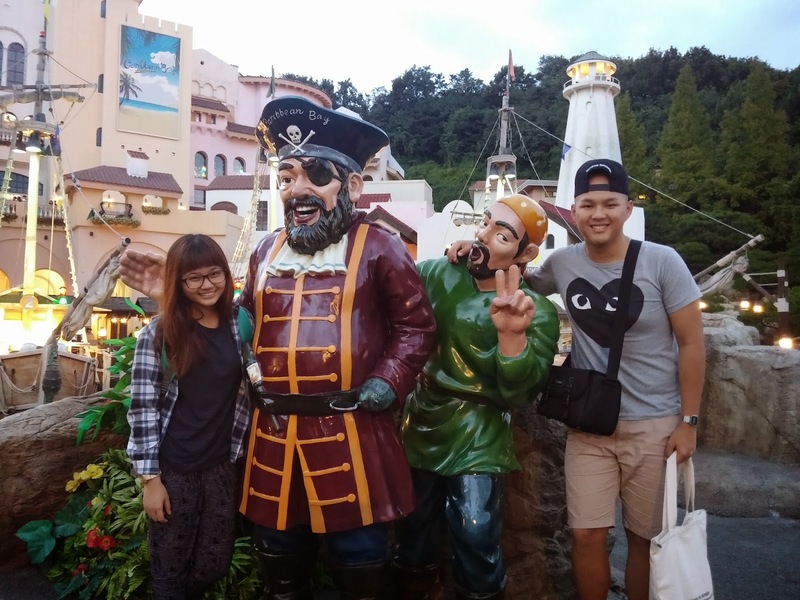 We wanted to go to Everland too, but it meant spending more just to go back again or to find lodging for the night. Dum dum dum!! Caribbean Bay! From Suwon (Bundang Line) we went to Giheung Station and changed trains again (YongIn EverLine) The trains here are a little cuter because they're not counted as the underground metro, but called LRT (which I didn't find out what its for) and it's the same name as the LRTs that we have in Singapore that run the same way; serving only a smaller area rather than a longer connection. Here's the deal about the shuttle bus stop here at Everland/Caribbean Bay: When you're taking the shuttle bus back to the train station from Everland, you have to take the one that caters to Car Parks 4 and 5, because the train station is located at Car Park 5. There're 2 kinds of buses, one that serves Car Parks 1-3 and the former one I talked about. Take note! When you enter, you can choose a few different places to go to for lockers. But first things first, you'll see a Bay Coin Service Center. 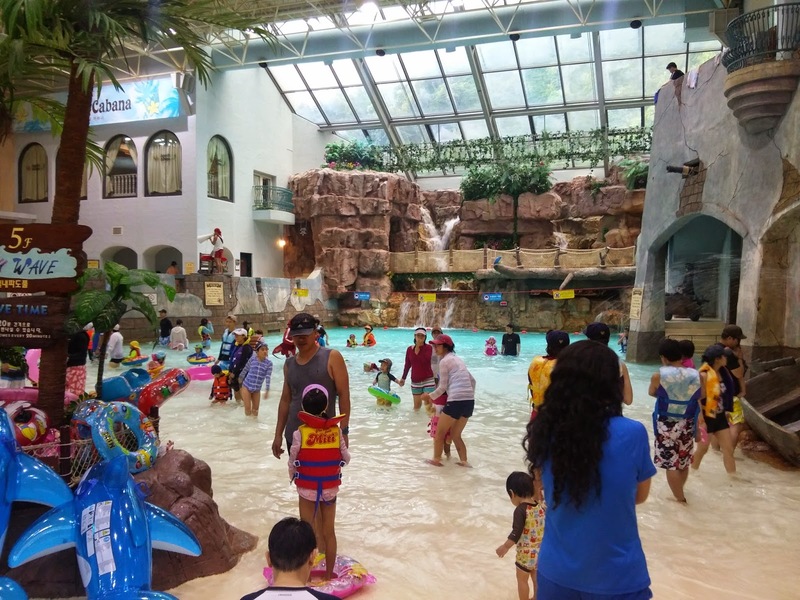 Basically, Bay Coins are what you use to go cashless inside the water park. When you need to buy food, snacks or drinks, you'll use this bracelet where you first reload money into, to scan and pay for stuff. There're certain amounts that you can put in, starting from 10,000W to 50,000W. The food and drinks inside are really marked up in price because that's where they get their revenue from, so beware, if you're going to eat something that will satisfy you, you'll need more than 10,000W. 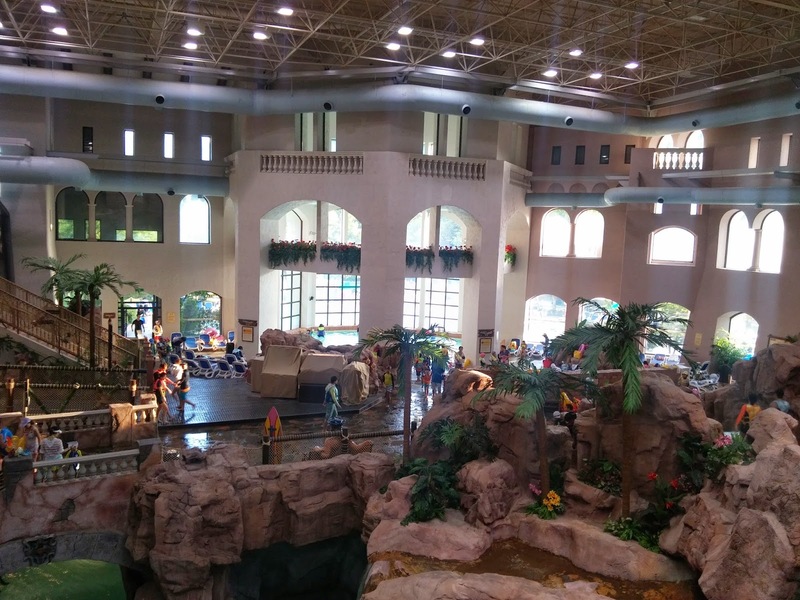 There're indoor and outdoor sections as well, so you can choose where to go and things like that. 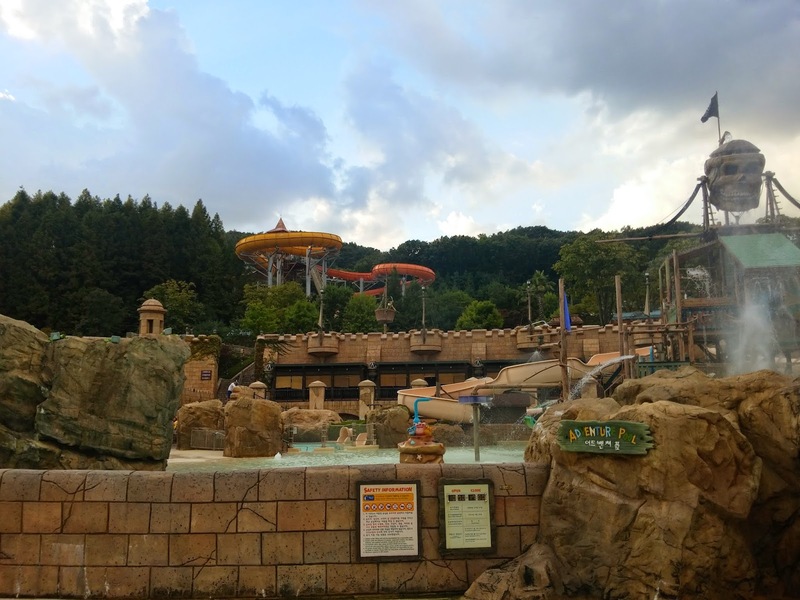 The indoor one is mostly for kids and toddlers that aren't tall enough to take the attraction rides outside, and also the outdoor closes earlier so make sure you get enough of the outdoors before looking around indoors. 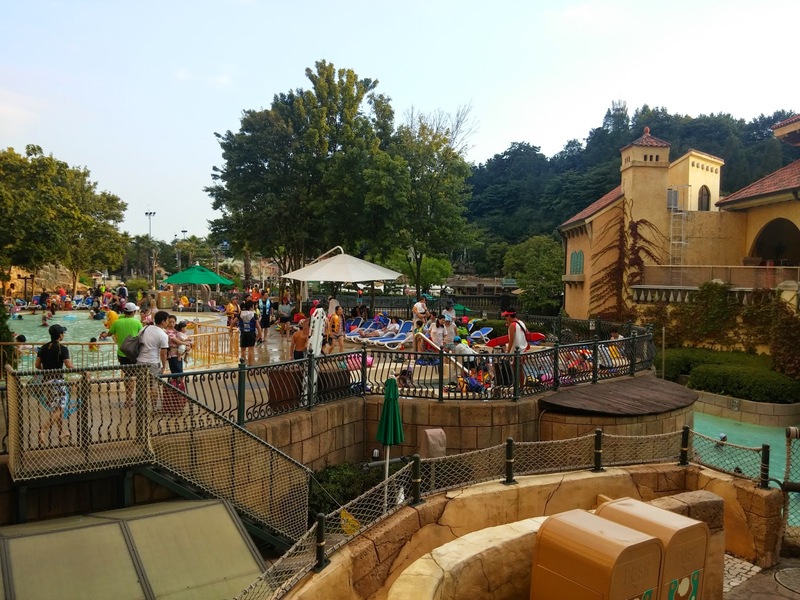 My friends who went on Thanksgiving Day itself said that they only waited around 30 mins per ride because there were almost no Koreans there and only foreigners. For us, even though we went during that period, it was on a Saturday so it was packed and we waited roughly around 50 mins to an hour per ride. In the end we got tired of waiting and ended up only riding 3 rides. Tower Raft: A big tube that sits 4, and just the usual slide around all the way till you hit the bottom. It's not very scary and doesn't do much except the turns. The trick here is to be heavy. The heavier your tube, the higher you go when you turn and the more water is splashed on the people in the tube. Boomerango: This one looked much more fun than the Tower Raft that we took.. But the queue was much longer so we took the former one instead. 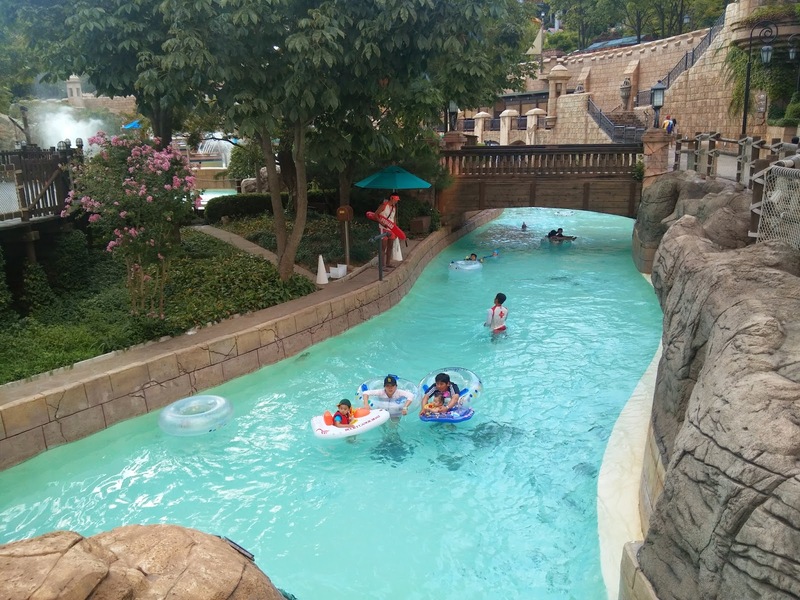 In this ride, it's also 4 per tube, but what happens is at the end of the ride you go down this long and steep slide up a curved wall and then back down the opposite direction into the water, hence the name "boomerang". Tube Ride: The tube ride is the normal ride for single riders, or dual riders. The tubes don't go very far because it's one of the smaller rides with shorter queues. But it's pretty fun, ending up in the water with a big splash. Water Bobsleigh: In this one, the slides are pretty steep and you get the feeling like you're flying for just a millisecond when you're at the peak of the slide and it steeps down. So you go down with your arms across your chest, legs first. Aqualoop: Apparently the most scary (and famous) ride of Caribbean Bay. This ride has 4 tubes, each a different color but translucent so you can see outside and inside. What's special about this ride is that there are 360 spins so you literally go upside down. I don't think I've ever seen or ridden one like that elsewhere. Unfortunately it was closed when I was there... so I didn't get the chance to ride it. 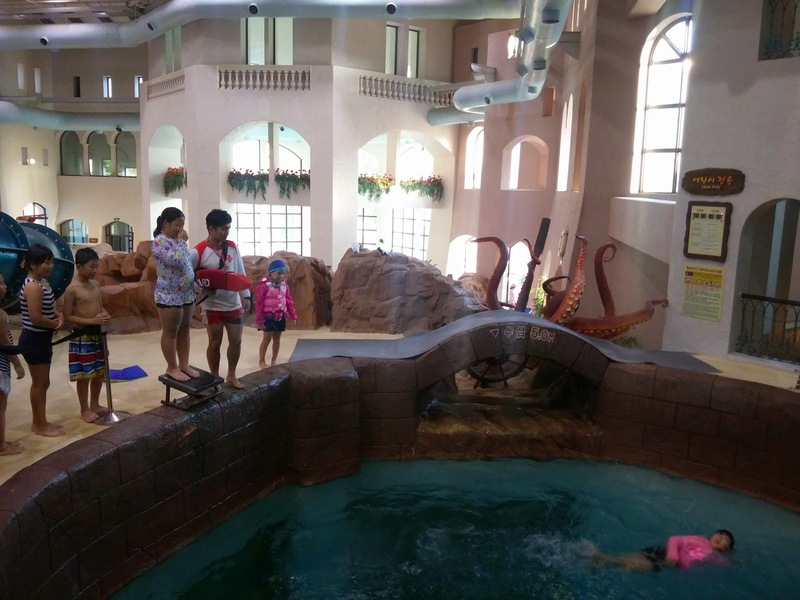 Other than just rides and pools, there're also spas and hot water baths of different temperatures where you can just sit in and relax. Somewhat like Japan, in Korea the people really LOVE getting into hot baths and just soaking inside. Thus that's how I think they have their clear, white and smooth skin. After we were done playing with all the rides, took a shower and the came back out to take photos. The shower area is totally like a jjimjilbang. They have everything, from soaps, shampoo, dryer, powder, gel, wax and so on. Such an awesome place! It's also incredibly clean and sanitary. We didn't get any food while we were playing inside, so when we were done we were simply famished. Off to find food! Since it was already so late, we decided to get off at Giheung station and walk around to find food. 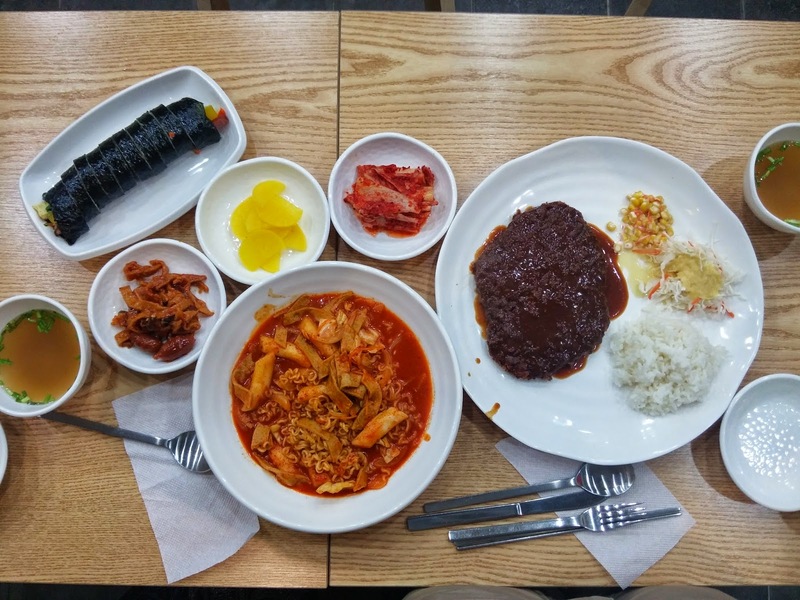 Managed to find a nice Korean-style place run by 2 sisters and it wasn't those chain-looking restaurants like Kimbap Nara (김밥나라) which stands for Kimbap Country. We ordered the Tonkatsu (돈까스), Rabokki (라볶이) basically just ddeokbokki and rameon, and a Tuna Kimbap (참치김밥). The food was pretty good, in my opinion. We were pretty hungry so the food really hit the spot. Just drooling right now while blogging about the food and the trip. Overall it was a really fun day and I'm glad for the opportunity to have gone while it was on discount. If you guys ever have the chance to go when you're in Korea, please make sure you go. The rides are fun and are different from the ones elsewhere, even in Singapore.